I'm reading every Aquaman solo adventure in publication order. After I read each story I will post the cover/splash page and a few thoughts on the story. Aquaman's jealousy when another swimmer wins the Seaman of the Year award distracts him from his crime fighting. Quotefile: Aquaman's Advertising, "Come to derrick 1 mile south of Keel Lighthouse on May 5, and watch Aquaman in action!" Finny Friends Report: On the splash page, two seals hold up Aquaman's sign. 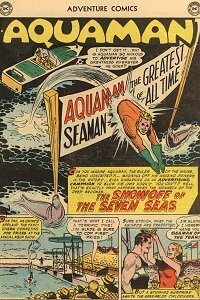 Aquaman writes "This is Aquaman Greatest Seaman of the Year" on a whale in squid ink, then has the whale cruise along the beach while he balances on an octopus balanced in the whale's spout. The octopus later holds Aquaman's bucket of luminous oil paint. Seals toss around a ball with Aquaman's advertising message on it. Sea eagles carry a banner with Aquaman's message. At the derrick itself, seven whales spout water up the derrick, which Aquaman explains that he plans to dive into. Aquaman rides his trusty sea cow (still unnamed). The whales dive when the derrick explodes, and there's no indication that they were hurt... but they should have been, as the explosion was at the bottom of the derrick, where the whales were positioned. Once again Aquaman ignores his reputation in order to catch the bad guys. And, as usual, the Coast Guard is in on the trick. But everyone else assumes that Aquaman is a conceited show-off and begin to despise him. The bad guy is named T.N.T. Dillon, and has sworn to get Aquaman back for putting him in jail. People wonder why Aquaman is ignoring his threats while playing around at advertising his own greatness... but it's all a huge effort to get Dillon to play his hand. A mega-sting operation. Have you read this story? What do you think? All content of this weblog and website is Copyright © 2008 by Laura Gjovaag, unless otherwise indicated. All quotes are © the original source. Please see the full disclaimer for more information.